Beauty Costs > How Much Does Embroidery Cost? 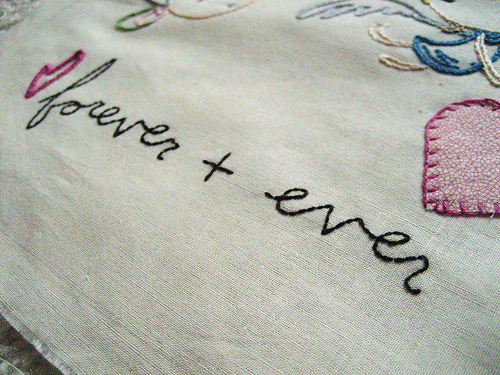 Embroidery is the process of decorating fabric with a needle and yarn. Embroidery may also include other materials such as beads, pearls and sequins. This process is often used with coats, blankets, hats, dress shirts and golf shirts. The price of embroidery will depend on the design you want, the item being embroidered, the professional doing the job, the complexity of the job and geographical location. On average, plan on spending anywhere from $3 to as much as $15 per small piece such as a simple hat to a t-shirt. This will usually include anywhere from 1,000 to 5,000 stitches and won’t include the item. The more stitches you need for a particular piece, the more it will cost. For example, larger logos that take up more space, such as on a jacket back, for example, can cost upwards of $30 to $45 per piece. Again, this won’t include the item. In most cases, a professional will charge by the number of stitches they need to use, and of course, the larger the job, the more you’re going to pay. To play it safe, it is best to budget $1 to $2 per 1,000 stitches. Some retailers may also charge by the letter, and if this were the case, it should cost about $1 to $2 per letter, with most stores asking for a minimum payment before they start the work. The Embroidery Authority, for example, lists its pricing here. According to the pricing chart, one to five items would cost $8 each with up to 10,000 stitches. However, the more items you purchase at once, the lower the price drops. For instance, if you to purchase more than 500 items, then the price would drop to $3 per item. Another way a company may charge is simply by a flat rate/job. Using this method, a company may show an example and what they would charge for it. For example, it may be something as simple as a polo shirt with a business name in the corner. A polo, with the embroidery, can cost anywhere from $15 to $22, while a hat, depending on the material it’s made from can cost $12 to $25. Refer to our table below to see what an item plus the embroidery would cost. NOTE: These are the prices to have a simple logo or company name embroidered on the item, and the costs can drop per item if you were to purchase in bulk. The price estimates, as noted above, should include, unless otherwise indicated, the embroidery only; however, inside the table, this would include the item and the embroidery services. Most of the time, when you make a purchase online with an online retailer, they will include everything with their quotes. A setup fee, no matter how large or small the job may be, will often be charged. From what we have seen, this setup fee will be no more than $25 on average; however, some may claim the setup fees are “free,” but these prices will be tied into the overall price. The setup costs will depend on the complexity of the item. If the company has to design the logo for you, they will most likely charge a design fee as well. The price will greatly depend upon the complexity of the job. A simple font will be much less than designing a graphic. Embroidery jobs, depending on the job size, can take anywhere from three to five days on average, sometimes more. Larger jobs can take longer. If you want to have the job expedited, expect to pay a rush fee. Orders placed online can often incur delivery fees, especially if you don’t meet the minimum order requirement. All stores will vary, though. Embroidery that is done by hand rather than a machine can cost significantly more. If you want the job done by hand, expect to pay 10 to 15 times more than the rates mentioned above. Additional colors, if you needed more than one color on an item, can be an additional charge. Most professionals will charge per color, using the estimates provided above. For example, if you were to need two different colors and each required 5,000 stitches, then you would be charged 5,000 stitches times two plus the setup fee. If you want to have a customized embroidery job, most companies will ask that you place your logo in a JPG or PDF format. Get quotes from at least three to five companies both online and in person to see what they may charge. By buying bulk, most companies will be more than happy to provide a discount. Embroidery is not your only option when personalizing clothing. You can also consider screen-printing, which can sometimes be cheaper. Most companies that perform embroidery also perform screen-printing, so you can check both prices and make your decision based on the quotes.